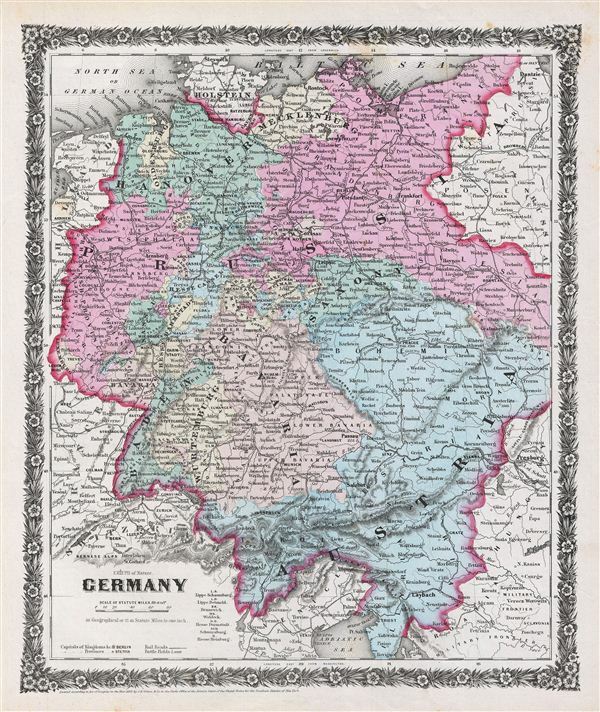 A rare example of Colton's 1858 map of the Germany. The map covers Germany from the Baltic Sea to the Adriatic Sea and includes Hanover, Mecklenburg, Prussia, Baden, Bavaria, Wurtemburg, Saxony and Austria. This beautiful hand colored map is a copper plate engraving, featuring a delicate floral style border only used by Colton in this particular atlas. It offers fine detail throughout with elevation rendered by hachure. Divided and color coded according to kingdoms and provinces, shows major towns and cities, railroads as well as geological features such as lakes and rivers. The legend on the bottom left corner indicates locations for Capitals of Kingdoms, Provinces, Rail Roads and Battle Fields. One of the battle fields marked on the map indicates to the 1813 Battle of Leipzig. One of the largest battles in europe before World War I, the battle of Leipzig was fought between Russia, Prussia, Sweden and Austria against Napoleonic France. The battle led to the end of Napoleon's rule in Germany. Dated and copyrighted to J. H. Colton, 1859, this map is by G. Woolworth Colton and the text is by Richard Swainson Fisher. Published from Colton's 172 William Street Office in New York City an issued as part of the1859 edition of Colton's Illustrated Cabinet Atlas and Descriptive Geography.